Showcasing the string section of the Ensemble, this programme features some of the repertoire’s best-loved pieces including Grieg’s zesty Holberg Suite and Vaughan Williams’ richly-scored variations on the folk song Dives and Lazarus. The Welsh composer Grace Williams’ tone poem Sea Sketches vividly depicts the moods of the sea in five movements: High Wind – Sailing Song – Channel Sirens – Breakers – Calm Sea in Summer. Throughout the year marking the 100th anniversary of women being given the vote in Great Britain, the Bristol Ensemble is programming works by female composers in its concerts as part of its Notes for Women series. At the heart of the project is a series of three concerts at St George’s Bristol devoted solely to music by women. The first of these takes place on 28 April, exploring music from plainsong to the Baroque. From the other side of the Atlantic, Copland’s Clarinet Concerto opens with a slow and expressive movement, full of longing, before a virtuosic cadenza leads into the lively, jazz-inspired second movement. 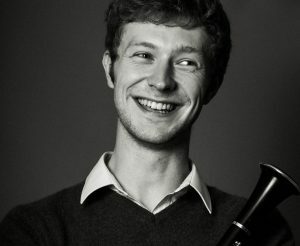 The Bristol Ensemble is delighted to welcome back the clarinettist Oliver Pashley as soloist.